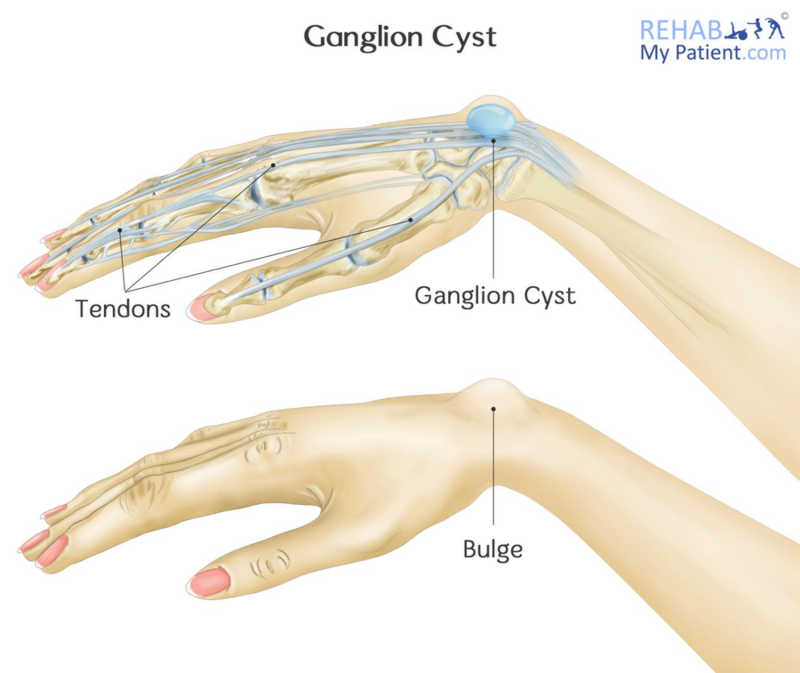 Ganglion cysts are a noncancerous lump that tends to develop along the joints or the tendons within the hands and the wrists. They can also occur in the feet and the ankles. They are generally a round or oval shape and consist of a jelly-like fluid. A small cyst can be the size of a pea, while larger ones average 2.5 centimeters in diameter. They can become painful when they are pressed onto a surrounding nerve. The location can interfere with movement of the joints. If the cyst begins causing you problems, you might need to have the cyst drained with a needle. Removal of the cyst surgically might also be an option. If you aren't having any symptoms, treatment might not be needed. In many cases, these cysts will end up going away without any further complications. Putting pressure through your joint with various movements can cause pain, so try to minimize these as this can make the cyst worse. Some doctors might recommend that you wear a wrist brace or a splint to help immobilize the area. As the cyst continues to shrink in size, it can release the pressure felt on the nerves, which helps to relieve pain. In this particular procedure, a needle will be used to help drain any fluid from the cyst. Before the procedure begins, an enzyme might be injected into the cyst to allow the contents to move about freely. After the aspiration occurs, a steroid might be injected into the cyst to help reduce the likelihood of it coming back again. If you have tried other treatments and they haven’t worked, surgery might be what you need. This procedure involves removal of the cyst and the attached stalk to the tendon or the joint. In rare instances, the surgery might end up injuring the surrounding blood vessels, tendons or nerves. Cysts can come back, even after undergoing surgery. Some complementary practitioners, osteopaths, and other medical practitioners believe you can "bash it with a bible", or other hard book. It is possible burst the cyst, but it needs to be hit pretty hard and that in itself can be painful. Also it can take many hits to burst it. This method is generally not recommended, but can be successful. Even though these cysts can develop in anyone, they tend to occur commonly in women who are between 20 and 30 years of age. Tendons and joints that were previously injured are more likely to get a ganglion cyst later on. For those who have arthritis in the joints nearest the fingernails are at an increased risk of getting a ganglion cyst by the joints. Ganglion cysts grow from joints or tendon linings. It’s unclear what causes the cyst to form in the first place, but you want to have it looked at by a medical professional.